Tulsa Heartburn and Reflux Center offers two treatments for Barrx: endoscopic mucosal resection (EMR) and radiofrequency esophageal ablation (RFA). Endoscopic mucosal resection (EMR) is a non surgical procedure, which removes cancerous or abnormal tissues from the digestive tract. EMR is performed with a long tube (endoscope) equipped with a light and video camera. The endoscope is passed through your throat to reach an abnormality in your esophagus, stomach or upper part of the small intestine. EMR can also be used as a diagnosis for Barrett’s esophagus. Radiofrequency esophageal ablation (RFA) is a technique where tissue is heated until it is no longer alive. RFA is performed in an outpatient setting and no incisions are involved. 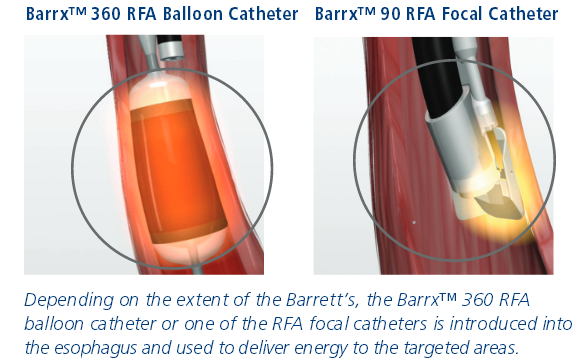 There are two different device types: a balloon catheter in various sizes and a series of RFA focal catheters. After the technique patients may experience chest discomfort and difficulty swallowing for several days, both which are treated with medications prescribed by the physician. What happens during treatment with Barrx ablation technology? Barrx ablation technology is a very specific type of ablation, in which thermal (heat) energy is delivered in a precise and highly controlled manner. Barrett’s esophagus tissue is very thin and is, therefore, a good candidate for removal with ablative energy. Delivery of ablative energy with Barrx technology can achieve complete removal of the diseased tissue without damage to the normal underlying structures. Clinical studies have demonstrated the Barrett’s tissue can be completely eliminated with Barrx ablation technology in 98.4% of patients. Patients may experience some chest discomfort and difficulty swallowing for several days after the procedure, both of which are managed with medications provided by the physician. In clinical trials, these symptoms typically resolved within 3-4 days. Patients are provided with anti-acid medications to promote healing of the treated esophagus and replacement of the diseased Barrett’s tissue with a normal, healthy esophagus lining. A follow-up appointment is scheduled within 2-3 months to assess the response to treatment. If any Barrett’s tissue remains, additional therapy may be recommended. Successful elimination of the Barrett’s esophagus tissue does not cure pre-existing GERD or the associated symptoms. Our physicians will guide you regarding long-term GERD therapy.